Nice spring sledding. Too bad we hit a Norest Storm. of about 80. Wow, it was beautiful out. The sun was shining through crystal clear blue skies and yet, everything was still white and pretty. Sun glasses were a must. With all that warm sun, I knew that the snow was slowly melting. The mounds of snow here were slowly getting smaller and the lake was slowly rising. 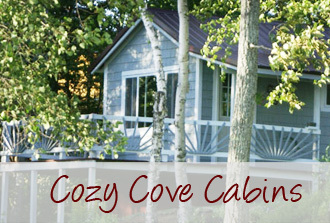 Cozy Cove Cabins. Our “”bottom 40″”, (our lower yard) which is now under water, ends where the ice begins on the video. Even since Thursday, the lake/ice color is getting darker and darker which means the ice is getting thinner and thinnerÃƒÂ¢Ã¢â€šÂ¬Ã‚Â¦soon the ice will break apart and we will see the last of winter. We went away a few days and 2 snow storms hit Jackman ❗ Last week we got about 16 inches and last night, we got over a foot here at Cozy Cove Cabins. If you have not tucked away that snowmobile, get on up here for some fantastic spring sledding. Give us a call and spend the weekend or even just the night. It is about 40 today and a little overcast but the weather this weekend should be nice. Reports form the Border Riders Club are as long as we have snow, they will groom the trails. Another storm due on Monday…will it bring us rain or more snow ❓ Check back later. Since the new laws took affect a few years ago which govern where we can ride: you must ride on designated trails; ATV clubs in New England have worked hard to develop relationships with land owners, put a lot of time and money into developing these trail systems, and had to set limits on their use. April is “”mud Season”” and although this may be the fun time to ride 😛 , riding the trails now would just tear them up…affecting the whole season!